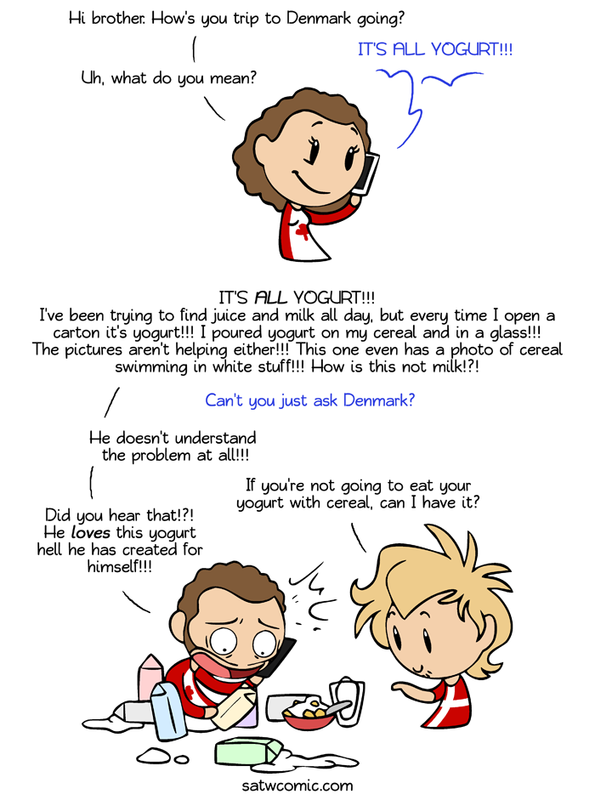 Apparently it's a common problem for people who move to Denmark that most cartons that look like they contain milk or juice actually contain yogurt. "This has fruits on it. Surely this is juice" Nope, fruity yogurt. "The stuff that comes out of this carton is super runny. Surely this is milk" Nope, runny yogurt. Danes love yogurt. Hint, look for the word "mælk". It might say Minimælk, Sødmælk, Skummemælk and so on, but if the letters "mælk" are in there somewhere you can be relatively sure it's milk. I have seen yogurt milk too though, so be careful. Brother Canada: Hey, what's up? Sister Canada: I need your help. Can you come here? Brother Canada: I can't. I'm buying milk. Sister Canada: Alright, well hurry up and come over here. Brother Canada: I can't find them. Sister Canada: What do you mean you can't find them? Brother Canada: I can't find them. There's only yogurt. 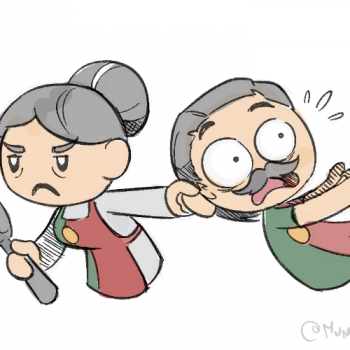 Sister Canada: What do you mean "there's only yogurt"? Brother Canada: It means there's only yogurt. Sister Canada: Well then get out of the yogurt aisle! Brother Canada: Alright, you don't have to shout at me! (moves to the next aisle) There's more yogurt! Sister Canada: What do you mean "there's more yogurt"?! Brother Canada: There's just more yogurt! Sister Canada: Go into the next aisle! Brother Canada: (moves to the next aisle) There's still yogurt! Sister Canada: Where are you right now?! Brother Canada: I'm at yogurt! Sister Canada: WHAT DO YOU MEAN YOU'RE "AT YOGURT"?! Brother Canada: I MEAN I'M AT YOGURT! Sister Canada: WHAT STORE ARE YOU IN?! Brother Canada: I'M AT THE YOGURT STORE! Sister Canada: WHY ARE YOU BUYING MILK AT THE YOGURT STORE?! @Highgrove although I must disclose that you'd hardly (or never) find in a Danish supermarket three isles of similar things. It's more like two brands of each product, two flavours of each, and that's it. You have yoghurt, milk, cheese, eggs, kefir & similar, Danonino, pretty much all dairy + eggs stuff in a 3-meter (~10 ft) aisle. Not many colours, either. @Highgrove Lol, reminds me of another on with Aph China and Aph England. They were in a soup store. @Highgrove Take all my +1s! Heh, this reminds me of the story my grandma told. My grandfathers native language was swedish and once, when they were having a roadtrip in Germany, he bought some vegetable oil as beer. Öl means beer in swedish but oil in german. His face had been quite a sight, when he had opened his "beer" in the evening and took a sip. But....whatever is wrong with everything being yogurt? It's so yummy and good for you! @TrainGal In my experience, yogurt is acceptable only when eaten with granola, or with fruit. Using yogurt in a smoothie is tolerable, at best. @GrayOwl You must've only encountered inferior yogurts. That's so annoying with all the irrelevant packaging! I recently bough a carton with a picture of a cow on it. Did it contain nice and juicy beef? No! Yoghurt! 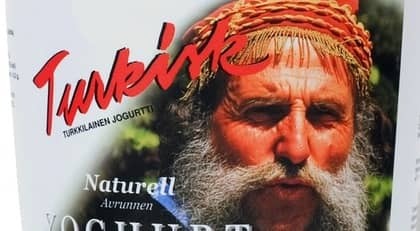 @ImportViking Hows this for irrelevant packaging: An old man on the package of turkish yogurt. But the old guy is greek! @ImportViking "Its all greek" is an interesting term. Does it mean that the greek people can read every weird language ever, since its all greek? @Deviant I have no idea where it comes from. For what I know, it just means 'it's ununderstandable'. I know that different languages/cultures have different expressions. In Dutch, for example 'it's all Chinese' when one can't understand. 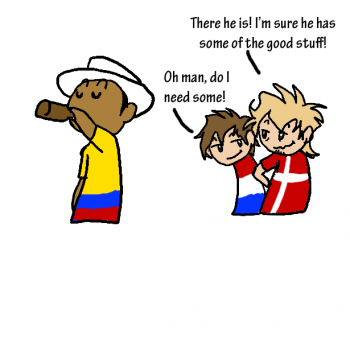 @ImportViking Hmm. I wonder, if we followed the thread far enough, from greek to chinese and further, if we can find the original place, where everyone knows all languages. @Deviant the expression isn't about someone who understands all languages. It's just that Greek or Chinese looks or sounds gibberish and completely ununderstandable to some people, so when they say it's Greek or Chinese they just mean to say they don't understand what's written or said. And for what I understood, a group Proto Indo European languages are seen as the 'parent' of all we speak from Europe to South Asia. Plus all countries where one of these languages is the default nowadays due to the colonial era. I guess that covers about 75% of the population of the world. @Deviant no worries. Keep on joking. that orange juice you're drinking? - runny orange flavored yogurt. that lovely steak you had last night? - congealed beef flavored yogurt. that cute girl you saw at the super market? - sentient anthropomorphic yogurt. @Uocjat Is it really too much to ask to learn the most basic words for the things you need before shopping? "Mælk" for "milk" and "yoghurt" for "yoghurt" isn't so hard, is it? Dang. My husband bought a carton of milk when we were in Iceland. We still don't know what he drank. @Linaste whatever it was, at least he ate his mistake. Literally. Iceland is getting there too, only with skyr. Icelandic Skyr, coming soon to everywhere near you. @YuKaraya Try Trader Joe's, they've got it. It's labeled Icelandic Style Nonfat Yogurt. @403_forbidden That ad sounds amazing, all we get in Ireland is this kid running about with telegrams after a bowl of Skyr, then he's an old man having a bowl of Skyr. We get the same ad, along with some similar ones in the UK. What it doesn't tell you is that he's the kid in the morning and has aged that much by the evening. @SisterIceland We do have skyr in Denmark. Loads of it. But it comes in buckets, not cartons so I guess people are less likely to mistake it for milk? But Skyr is sooooooo much better than yogurt! I fell in love with Skyr when I visited Iceland too many years ago, but I live in the middle of the US and until very recently, the only time I could get Icelandic Skyr was when visiting Washington DC or Boston. Happily, it is now it is available in a grocery chain near me that specializes in natural foods -- woo-hoo! There has been some skyr made in New York state available here for a few years, but it pales in comparison. Yay Skyr! Yogurt, yet another example of the Scandinavian tradition of taking something and leaving it out long enough to turn it off-color and possibly a bit smelly. Not really, because natural yoghurt has the same colour as milk and doesn't smell any. Piimä, which is really big in Finland and marketed internationally as 'kefir', is also the same colour, but might smell just a bit sour. Not bad though, just a sort of fresh sour. Fil or filmjölk (two slightly different variants, in Swedish)/viili (in Finnish) is another fermented milk product that also has the colour of milk (though there might be thin layer on top with the colour of cream) and doesn't smell. Then there's skyr (Icelandic I think), which in consistency is similar to viili, but doesn't really taste the same. All of these are ways to preserve milk so that it doesn't go a bad sour as it otherwise would if stored. There is piim, hapupiim, pett, sõir, keefir and jogurt. There is piim, hapupiim, pett, sõir, keefir and jogurt. " But if my Google and Wikipedia doesn't lie to me (which it did, 2 of these were just translated as buttermilk), they are all bad, and the real star is called rahka/kohupiim. Nothing beats that one. Maybe pett is buttermilk, I am not sure. Pett is a subproduct. Sõir is a subproduct. Hapupiim is an (over-)ripe product. Keefir and yoghurt are refined products. There are different kinds of kohupiim. The bland or salted one is kodujuust. The ordinary one is simply kohupiim. There are also kohupiim with additives (vanilla, etc). And kohuke is kohupiim with chocolate exterior or kohupiim with jam interior. The root of the word is k(u)ohu, such as kohutav (awful, a ruckus creating an uprising) or finnish 'kohtu' (a womb of a female, which incidentally sometimes also develops an uprising resulting in a birth) or 'kohustus' (a responsibility, something stemming or uprising from some other thing) or estonian 'kõht' (a belly). Oh, and viimne+kohus is "the final uprising and judgement day" of christianity. And kohtu+kutse for estonians means "call to a court", but for a finn it means "call into a womb". "He loves this yoghurt-infested hell he's created!" I'm going to enjoy that line for a few days. @Lidonious Unfortunately Canada has all of those things too...just not to that extent. True, but I think the different extents make a significant difference. @Lidonious That is such a mean spirited thing to say. Well, I am a mean person. Atleast that is what people tells me on the internet whenever I relay the prejudices aquired about USA.